Cello-oligomers have a wide application range and are gained from three different cello-oligomer production paths, which show different drawbacks, namely acid or alkaline hydrolysis of cellulose, chemical or enzymatic synthesis, and enzymatic hydrolysis of cellulose using cellulase mixtures. Therefore, this study aims at a novel route towards cello-oligomers using purified endoglucanases. 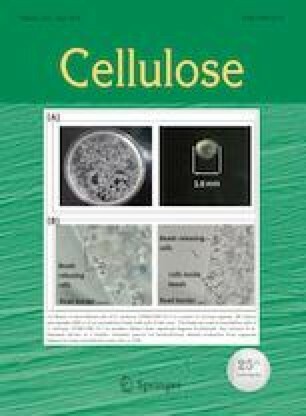 From the renewable raw material cellulose, pretreated by an ionic liquid, cello-oligomers with a weight average degree of polymerization (DPW) of 65 were directly obtained by enzymatic hydrolysis. During hydrolysis, between 14.1 and 24.5 mass percent of monomeric and dimeric sugars were formed as byproduct. A second ionic liquid pretreatment of the cellulose, remaining after the first hydrolysis, and a second enzymatic hydrolysis resulted in cello-oligomers with a DP of 35. XRD deconvolution and Raman analysis confirmed that crystallinity remained unchanged during enzymatic cellulose hydrolysis. The online version of this article ( https://doi.org/10.1007/s10570-019-02390-4) contains supplementary material, which is available to authorized users. Parts of this work were performed as part of the Cluster of Excellence “Tailor-Made Fuels from Biomass”, which is funded by the Excellence Initiative by the German federal and state governments to promote science and research at German universities.